What does it take to push you to your breaking point? For some people, it’s a lack of sleep. For some, it’s emotional pressure or stress at work or just one more text from your family member about why you’re still single. Everyone has a straw that breaks your back — it just causes you to snap or lose hope altogether. We’ve all been there. And in this week’s episode, so has Oliver Queen. I’ll explain more about this in the rest of the review, but I’m pretty conflicted about Arrow’s central moral dilemma and villain right now. On the one hand, I actually enjoyed last week’s episode (“Checkmate”) because it focused on the fact that Oliver is being bested by a guy who’s intent is to dismantle him bit by bit. I love the precision with which Adrian has laid out his plan — this isn’t erratic or driven by emotion. It’s logical and it’s calculated. It’s nice to have a villain with a plan. On the other hand, “Kapiushon” spent a lot of time (some of it necessary to set up present-day Oliver) in flashbacks with the Bratava. And I’ll be honest, I’m already bored of the Bratva and haven’t paid nearly enough attention this season to the flashbacks to be able to piece together the plotline. Shout-out to my Twitter followers who pieced it together for me! And while I loved Adrian’s motivations last week, the whole point of this week’s episode seemed kind of absurd to me — the revelation that Adrian wanted Oliver to arrive at was kind of weak (and I say that, having recognized the extremely weak motivation Music Meister used in this week’s The Flash. Not a great week for villains, I have to say). So let’s talk about that revelation, and what it means for Prometheus’ rise and Green Arrow’s fall moving forward. Confession is necessary for the soul. And here’s what I mean: when you can’t be honest with yourself, you can’t really be honest with other people. Sure, you might be able to tell them the truth but if there’s a secret that’s buried deep down inside of you and you refute it again and again or, worse, ignore it altogether, it will come out. And it will be unhealthy when it does. That’s why confession is such a staple of religion — in order to restore our relationships with ourselves and others, we need to admit when we’ve done something wrong. We need to be honest with our secrets. We need accountability, because otherwise we’re sinking in pools of darkness that we’ve created for ourselves. I think that the major reason I’m torn on this storyline and villain during this week’s episode is because I don’t know if I believe Oliver’s confession. On the one hand, our flashbacks demonstrate the fact that Anatoly is perceptive and points out the fact that Oliver enjoyed killing. While he vehemently denies this, Anatoly doesn’t appear to be convinced and warns Oliver that if he isn’t honest with himself, essentially stuff will come back to bite him in the end. But I’ve watched enough television crime dramas in my day to know that confessions under duress are generally not the kind you should take too seriously. If you push someone to their breaking point, they’ll say anything in order to free themselves. So I don’t know if I believe that Oliver loved killing people during his crusade and justified it because of his father’s list. It’s hard, at this point in a series, for the Arrow writers to get me to mentally retcon character development — which is what it kind of feels like they’re asking me to do at this point. And therein lies the real issue I’m having with this storyline: am I supposed to be suddenly believing that Oliver enjoys killing? What if I don’t believe that? What can I garner from this villain and story if I’m confident the villain is off-base? While Adrian Chase felt very calculated and intelligent in “Checkmate,” I spent the better part of this week’s episode being annoyed by his interrogation tactics, or lack thereof. Because the truth is that shouting at someone, shooting him with an arrow, and threatening harm to others to get Oliver to answer an incredibly vague demand became really tiresome after a while. I was on the verge of shouting, “HE HAS NO IDEA WHAT YOUR ACCUSATION IS. STOP ASKING HIM TO CONFESS A SECRET TO YOU” the entire episode. 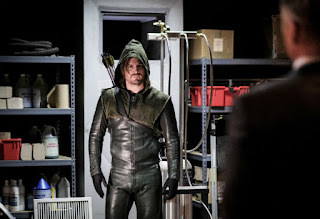 While I think there were some interesting elements at play in the episode — the comment that Oliver made about how all the things he did will never compare to the cold-hearted way Adrian kills people, including his wife, just because — I don’t know that it all worked well together and am struggling to figure out exactly what it was that just didn’t sit well with me. It might be the fact that almost the entire episode was Bratva flashbacks. The issue there is that I’ve become so bored by them this year that I generally tune them out. So to try and jump back into the flashbacks with a short attention span and limited recollection of the Russia plot left me floundering quite a bit. It also didn’t help that the episode OPENED with flashbacks either. I know we’ve all been begging for Bratva/Russia storylines but I don’t know that the way they’re done this year is compelling to me. I like Anatoly and Oliver’s relationship and their interactions, but I couldn’t care less about everything else that’s happening with Bratva and weapons of mass destruction and, apparently, Malcolm Merlyn. But back to our villain: Adrian was really interesting last week, and this week it felt odd — like the stakes weren’t as high (even though I don’t consider a rescue of Susan to be high stakes because her character is like an annoying gnat that just won’t leave you alone), because we know Oliver won’t actually die and we know Adrian Chase won’t die yet. And the secret that is extracted is so odd to me. I get that Chase is trying to break Oliver down little by little. The subtle and slow dismantling of his public image was pretty genius. But I don’t really understand, beyond Chase wanting Green Arrow off the streets, what the point of Chase’s crusade is. It doesn’t seem like he’s the kind of person like Slade or Darhk who just wants to run amok, turning Star(ling) City into a villainous hub. Chase is far too calculated and subtle for that. Truth be told, I think he likes the whole “play the hero in the light, villain in the shadows” schtick too much to actually out himself as Prometheus. So what does Chase gain from this confession of Oliver’s? It’s hard to say: is it satisfaction in watching someone being totally broken mentally and physically? Maaaaaaaaybe. But whatever the case, something about Chase’s methods in this episode didn’t feel compelling to me. Still, he did manage to get a confession out of Oliver: that he enjoyed killing because it felt good. And now we circle back to this secret of Oliver’s: do you believe it? Do you believe, re-watching season one, that Oliver gets a rush from crossing names off his father’s list? I don’t know that I do — I can see both sides at play here, and I honestly don’t know what I’m supposed to believe. I know what Oliver believes now. Oliver used to tout himself as the good guy and hero, and Chase’s undermining of that belief is the crux of his villainous crusade. He wants to draw a comparison here and say that Oliver is worse than Chase because at least he admits that he’s a killer and is a bad person. Oliver, Chase essentially argues, continues to pretend he is a hero when he’s really worse than Chase because he won’t admit that he enjoyed killing people. And the “enjoyed” is an important part too. It implies that once upon a time, Oliver enjoyed killing but this part of his life is behind him. I honestly don’t have much to say about this episode (shortest Arrow review in my career thus far), because I don’t really know what to believe to be true about Oliver. How am I supposed to view Green Arrow? As a hero? As someone who is a hero but enjoys killing the bad guys when he has to? As someone who is a hero with a dark secret in his past? Chase is the villain, that much is certain. But who is the hero in this story? 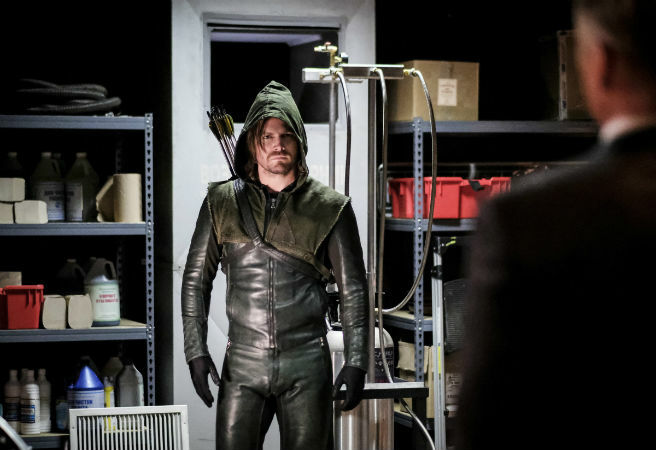 The episode ends with Oliver returning to the Arrow Cave, completely and totally distraught. He’s beaten up and battered — emotionally and physically. That’s why he says what he does in the end: that he’s done. He’s done playing the hero and trying to save his city and its people. He’s done being a good guy. He’s done being a vigilante. He’s just tired and done. So Adrian Chase’s plan seemingly worked (for now, because we all know the “Oliver is hanging up his hood” plot happens once every season, at least). He broke Oliver. And if that’s all he wanted, then WHY? What is this all seeming-nonsense leading to? I guess we have to wait to find out. But honestly, I — like Oliver — am a little bit tired. Stephen Amell slayed this episode. He was a rockstar and deserves credit for the intense scenes. Hey, remember when Evelyn was a thing? She’s still a thing! She and Adrian faked her death in front of Oliver, apparently, because Evelyn is a sociopath or something. Not gonna lie, I find her more compelling as a villain than one of the good guys. I weirdly missed seeing Malcolm on my screen. The stunts in this episode were pretty great. Kudos, team. What did you all think of the episode? Sound off in the comments below!